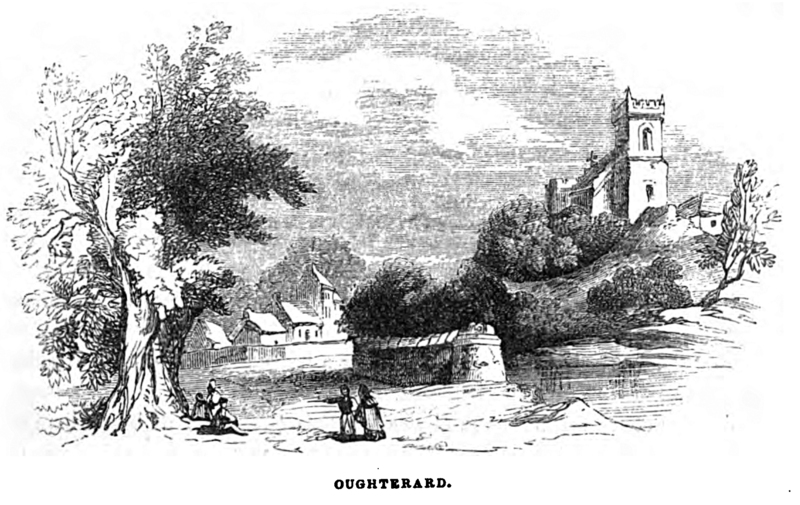 “Romantically situated within a mile of Lough Corrib, and watered by the Feogh, which forms a succession of small rapids, called the Salmon-leap, above the village, and carries its limpid stream through the town, passing before it reaches the lough, under a natural broken arch of limestone. 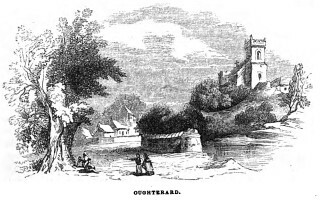 Oughterard contains a small barrack for infantry, a church, a commodious Roman Catholic chapel, a sessions house, and a small Inn where cars can be hired. Near the Salmon-leap is Clareville, the lodge of T. B. Martin, Esq. The country around is wild and romantic; but near the town it has been of late years considerably planted and improved. The shores of the lake are not bold; and boats with passengers ply across it to Cong, which is distant only nine miles. Along its margin a road extends for nine miles.